Sudoku Plus is a variant of sudoku that you might not have seen before. 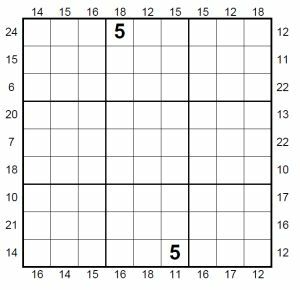 The puzzle grid itself is the same as usual: a 9x9 grid that you must place 1 - 9 in once per region (row, column and 3x3 box). However there are far fewer givens in the puzzle at the start - this puzzle only has two. This is because more information is given to you than with a normal sudoku puzzle by means of numbers around the outside of the grid. There is a number at the start and end of each row and column, and tells you the sum of the three numbers closest to it. Thus the number '24' at the start of row one tells you that the first three numbers in the row (cells, 1, 2, 3 of the puzzle) sum to 24. Using the information given to you by these numbers around the outside of the grid, you can whittle down the options and work out the unique solution to the puzzle that can be deduced through logic and maths alone. Please note it's a PDF that will open in a new window, and contains the solution on the second page of the PDF. Let us know how easy or hard you find it via the comments below!